John Robert "Johnny" Mize (January 7, 1913 – June 2, 1993), nicknamed Big Jawn and The Big Cat, was a baseball player who was a first baseman for the St. Louis Cardinals, New York Giants, and New York Yankees. He played in Major League Baseball (MLB) for 15 seasons between 1936 and 1953, losing three seasons to military service during World War II. Mize was a ten-time All-Star. Late in his career, he played with the Yankees when they won five consecutive World Series. Mize was born in Demorest, Georgia to Edward and Emma Mize. After his parents separated, his mother went to Atlanta for work, but Mize remained in Demorest with his grandmother. He excelled in tennis as a child and played on his high school baseball team. He later played baseball for Piedmont College. Mize was a distant cousin of Ty Cobb and his second cousin married Babe Ruth. Mize came up through the St. Louis Cardinals minor league system but was traded to the Cincinnati Reds in 1934. However, he suffered a groin injury and the Reds nullified the trade. In 1935, while struggling with one bad leg, he injured the other leg. Mize retired from baseball and returned home until the Cardinals asked him to see a physician in St. Louis. He had surgery for bone spurs. He was kept with the Cardinals in St. Louis after surgery, as he would not have been able to play regularly that season in the minor leagues anyway. The organization thought that he might get some opportunities to pinch hit with the major league team. Mize made his major league debut for the Cardinals in 1936. In 126 games, Mize hit for a .329 batting average, 19 home runs and 93 runs batted in (RBI). He later said, "I'm the only guy who played in the major leagues because I couldn't play in the minors." Mize was known as both "Big Jawn" and "The Big Cat" for his smooth fielding at first base. In 1937 he batted .364, but Cardinals teammate Joe Medwick took the title with a .374 average. In 1939, Mize finished second in the league's Most Valuable Player (MVP) voting after leading the league with a .349 average and 28 home runs. Mize's 43 home runs in 1940 set a Cardinals team record that stood for nearly 60 years. At the end of the 1941 season, however, he was traded to the New York Giants by Rickey, who famously believed in trading players before their skills began to decline. In exchange for Mize, the Cardinals received Bill Lohrman, Johnny McCarthy, Ken O'Dea and $50,000. Mize was involved in a 1941 lawsuit against Gum Products Inc. The company manufactured a set of baseball cards called Double Play. Mize sued because he argued that the company did not have his consent to use his image in the card set. Gum Products Inc. won the lawsuit, but the company stopped producing its Double Play series because of the expenses it incurred during the legal proceedings with Mize. The Giants pursued Mize after learning that their first baseman, Babe Young, was going to be forced into military service. In 1942, Mize hit for his lowest batting average to that point in his career (.305), but he hit 26 home runs and led the NL with 110 RBI. Mize spent 1943 through 1945 in military service during World War II. Returning to the Giants in 1946, a broken toe caused him to fall one short of the home run title, won by Ralph Kiner of the Pittsburgh Pirates. In 1947 he rebounded to hit 51 home runs and tie Kiner for the league lead. He also led in runs and RBI, and became the only player to strike out fewer than fifty times while hitting fifty home runs. Mize's 1947 totals in runs, home runs and RBI were all career highs. In 1948, Mize and Kiner again tied for the league home run championship with 40 each. Mize was traded to the New York Yankees late in the 1949 season after expressing discontent with his playing time. Mize during his time with the Yankees. Mize spent the last five years of his career with the Yankees, mostly as a part-time player, ending in 1953. He was, however, considered a valuable contributor to their winning five consecutive American League pennants and World Series titles. Despite spending part of the 1950 season on minor league rehab, he hit 25 home runs to become the second player to have a 25-home run season in both leagues. In the 1952 World Series against the Brooklyn Dodgers, he hit three home runs, one as a pinch-hitter, and was robbed of a fourth by Dodger right fielder Carl Furillo, who made a leaping catch above the fence in the 11th inning to preserve a win for the Dodgers. In October 1953, Mize announced his retirement. He said that he would rather retire while he was still popular with fans than to "hang around until they start to boo." Mize holds the major league record for the most times hitting three homers in one game, a feat he performed six times. He also was one of a handful of players (including Babe Ruth) to do it in both leagues — five times in the National League and once in the American. He was the first player to hit three home runs in a game twice in one season in 1938 and did it twice again in 1940. He finished his career with 359 home runs. Mize still holds Cardinals team records for most home runs in a season by a left-handed batter, most season RBI by a left hander, and most games with three or more home runs. He and Carl Yastrzemski are the only players to have three seasons of hitting 40 or more home runs, without a season of hitting between 30 to 39 home runs. After his 1953 retirement, Mize worked as a radio commentator and a hitting coach for the Giants. He coached the Kansas City Athletics in 1961. In the 1970s, Mize made his home in St. Augustine, Florida, working for a development by the Deltona Corporation called St. Augustine Shores. A picture of his house is included in David Nolan's book The Houses of St. Augustine. He was chosen by the Veterans Committee of the Baseball Hall of Fame in 1981. He had appeared on the regular Hall of Fame ballot in the 1960s and 1970s, where his highest vote percentage had been 43% in 1971. Mize spent the last few years of his life at his home in Demorest, Georgia. He underwent heart surgery in 1982 but returned to good health. He died in his sleep in 1993. Upon Mize's death, Ralph Kiner described him as "kind of an irascible guy" on the field, but "a very affable guy and a great storyteller" off the field. Mize's batting statistics were overshadowed by those of bigger stars of his era such as Ted Williams, Joe DiMaggio, Stan Musial, and Jackie Robinson. Mize's lifetime on-base percentage of .397 has become more appreciated in the light of sabermetric analysis. In January 2014, the Cardinals announced Mize among 22 former players and personnel to be inducted into the St. Louis Cardinals Hall of Fame Museum for the inaugural class of 2014. The Johnny Mize Baseball Museum is located at Piedmont College. The college also honors the slugger with the Johnny Mize Athletic Center, a sports complex that houses the school's basketball arena. 1 2 Grillo, Jerry. "Johnny Mize". Society for American Baseball Research. Retrieved August 20, 2013. 1 2 Thomas, Robert (June 3, 1993). 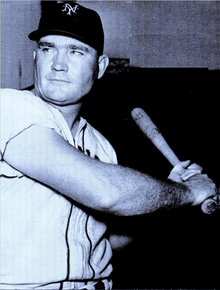 "Johnny Mize, home run slugger and Hall of Famer, is dead at 80". The New York Times. Retrieved January 31, 2014. ↑ Phelps, Myron (February 11, 2008). "Johnny Mize Collection". The Navigator. Retrieved June 10, 2008. ↑ Suda, Tim (January 28, 2008). "History of Sports". The Navigator. Retrieved June 10, 2008. 1 2 "Cardinals Interesting Fact". St. Louis Cardinals team website. December 1, 2012. Retrieved December 12, 2012. 1 2 Eisenbath, Mike (1999). The Cardinals Encyclopedia. Temple University Press. p. 245. ISBN 1566397030. 1 2 3 4 "Johnny Mize". Baseball-Reference.com. Retrieved January 31, 2014. ↑ Jamieson, Dave (2010). Mint Condition: How Baseball Cards Became an American Obsession. New York: Atlantic Monthly Press, imprint of Grove/Atlantic Inc. p. 92. ISBN 978-0-8021-1939-1. ↑ "Cards trade Johnny Mize to Giants". St. Petersburg Times. December 12, 1941. Retrieved January 31, 2014. ↑ "Mize, Johnny". Baseball Hall of Fame. Retrieved August 20, 2013. ↑ "Yankees release Big Johnny Mize to Kansas City". Evening Independent. May 15, 1950. Retrieved January 31, 2014. ↑ "Mize retires from baseball". Eugene Register-Guard. October 7, 1953. Retrieved January 31, 2014. ↑ "Johnny Mize joins list of famed bat coaches". Sarasota Herald-Tribune. June 7, 1955. Retrieved January 31, 2014. ↑ "Mize, 80, dies at home in Georgia". Los Angeles Times. June 3, 1993. Retrieved January 31, 2014. ↑ Jensen, Chris (2012). Baseball State By State. McFarland. p. 67. ISBN 0786468955. ↑ "Johnny Mize Athletic Center". Piedmont College. Retrieved January 31, 2014.